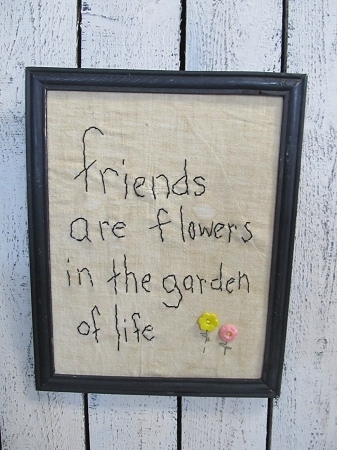 Primitive Friends are Flowers Stitchery Frame with Vintage Button Flowers. Friends are the Flowers in the Garden of Life. A great saying for the friend who is always by your side. Hand stitched lettering by Lynn with an added bonus of vintage button flowers. Black Wooden framed, no glass is this primitive stitchery. Size is 12" x 9 1/2". Sawtooth hanger on back. Great primitive piece for your home's decor.